Shenei Luchot HaBrit (the holy Shelah) by R. Yeshaya HaLevi Horowitz. Amsterdam: Immanuel son of Josef Athias, 1698. Illustrated title page (by the convert Avraham ben Yaakov). Shenei Luchot HaBrit contains many Halachic novellae, foundations in Kabbalah, homily and ethics, and incorporates all realms of the Torah. The book was received with awe throughout the Jewish world, and its teachings are quoted in the books of leading poskim and kabbalists. Many renowned Chassidic leaders were extremely attached to the study of the books of the Shelah. 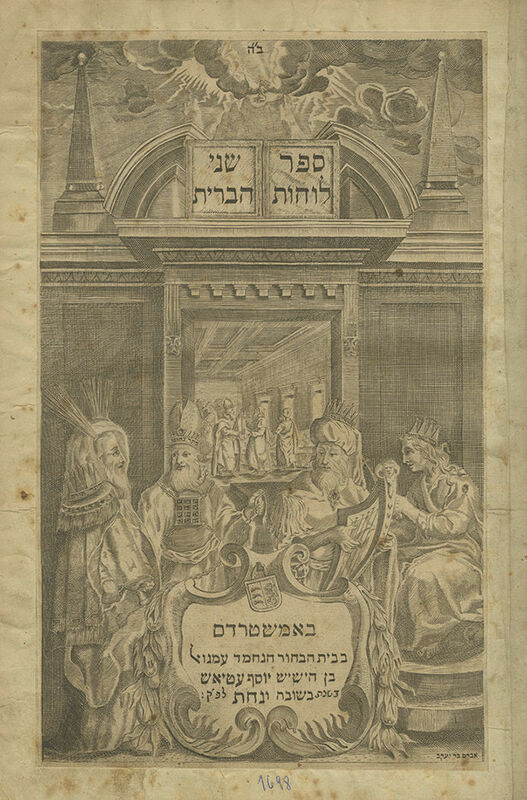 This edition of the Shelah was printed in Amsterdam in 1698, the year the Baal Shem Tov was born, and Chassidic lore ties these two events. In letters written by Rebbe Rayatz (Yosef Yitzchak) Schneersohn of Lubavitch (Letter 2, 853), he writes of an elaborate 1698 edition of the book Shelah HaKadosh. The year 1698 is the numerical value of 'nachat' and alludes to the heavenly gratification caused by the revelation of the holy book leading to the birth of the Baal Shem Tov. The Baal Shem Tov was used to saying that he was born in the year of the printing of the Shelah HaKadosh to enlighten the world with the light of G-d's Torah and fear of Heaven. The Rayatz of Lubavitch brings a wondrous tradition from R. Mendel of Vitebsk regarding the first and second editions of the Shelah: "When the Shelah was being printed, before it was completed, it was purchased as booklets, and this holy book enthused and inspired the hearts of the Jewish people, and the evil eye dominated it, and the infamous Chmielnicki massacres ensued"; "In the year the Baal Shem Tov was born, the second edition of Shelah was printed in Amsterdam, and then as well there was an accusation in heaven against the Jewish people in Poland, similar to the first accusation upon the initial publication of the Shelah, yet ultimately, it was a year of serenity" (Likutei Diburim HaMeturgam, I, p. 50). Corrections in Ashkenazic script on several leaves. , 2-3, , 1, 4-422; 44;  leaves. 30 cm. Good condition. The first seven leaves and the front binding are detached (the leaves are bound out of order). The illustrated title page was trimmed close to the border and was pasted on paper for restoration. Stains. Minor wear and tears to several leaves, repaired with paper. Pen inscriptions. Stamps. Old damaged binding, lacking spine.